Alabama Kept Doyle Hamm Alive So They Could Legally Murder Him. PS: BTW, they kept Doyle Hamm alive even though he was dying from terminal cancer, just so they could inject lethal serum into his body that would legally murder him. Excerpt “It was a gory, botched execution. They gave up when they could not find a vein,” Bernard Harcourt, a professor at the Columbia University Law School who is representing Hamm, said by email on Sunday. The execution has come under federal court review, with a U.S. district judge calling for the state to preserve evidence, including the clothes Hamm was wearing. Alabama Department of Corrections officials were not immediately available to respond to Harcourt’s comments. States including Oklahoma and Arizona have also conducted botched executions that raised questions about death chamber protocols in the 31 U.S. states with the capital punishment. 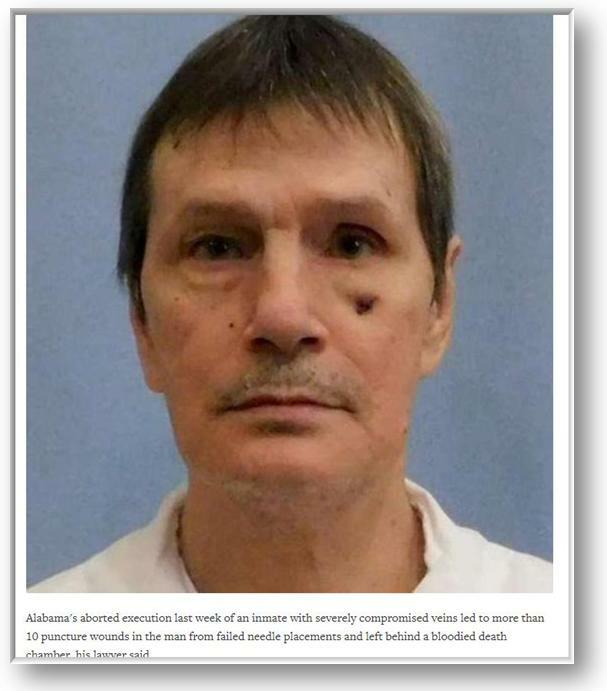 “I wouldn’t necessarily characterize what we had tonight as a problem,” Jeff Dunn, Alabama Department of Corrections commissioner, told reporters shortly after the execution was called off. There were two sets of medical personnel who tried to place a line in Hamm’s groin area or in an area between his knees and feet, Harcourt said, adding the inmate, who was examined by a doctor after the execution attempt, had at least 12 puncture wounds. In court filings in the days before the planned execution, Hamm’s lawyers said he had terminal cancer and a history of intravenous drug use that had severely compromised his veins. They said Alabama was rushing through a specialized execution protocol, increasing the chances of a flawed procedure. The state responded at the time it knew what it was doing and could handle the lethal injection. It has not indicated if it will seek a new execution date. The plan called for the insertion of intravenous catheters into Hamm’s leg or central vein, legal papers showed. “Our case was that this would be tortuous and bloody and they wouldn’t succeed,” Harcourt said. This entry was posted in health, Liberal Opinions, politics, Reality vs Tea Party Madness, religion, terrorism, Trump, Uncategorized, World and tagged Alabama, botched, conservative, Death, execution, murder, Penalty, political, republican, state, thinkingblue, torture. Bookmark the permalink.